Amongst the documents held at Glamorgan Archives detailing the experiences of Glamorgan soldiers at the front are several letters sending Christmas greetings to family and friends at home. Many are to be found within the Cardiff University Settlement Records. The University Settlement was established in 1901 by a group of academic staff at the University College Cardiff. They were seeking to improve social conditions in the more deprived areas of Cardiff by engaging in active social work with these communities, and they set up a base in Splott. The University Settlement was divided into four separate clubs: the Lads’; Girls’; Womens’ and Mens’ clubs. On the declaration of war in 1914, many of the lads enlisted and were sent to fight at the front, in France and Belgium. Several kept in contact with Mr and Mrs Lewis, a couple closely associated with the University Settlement. 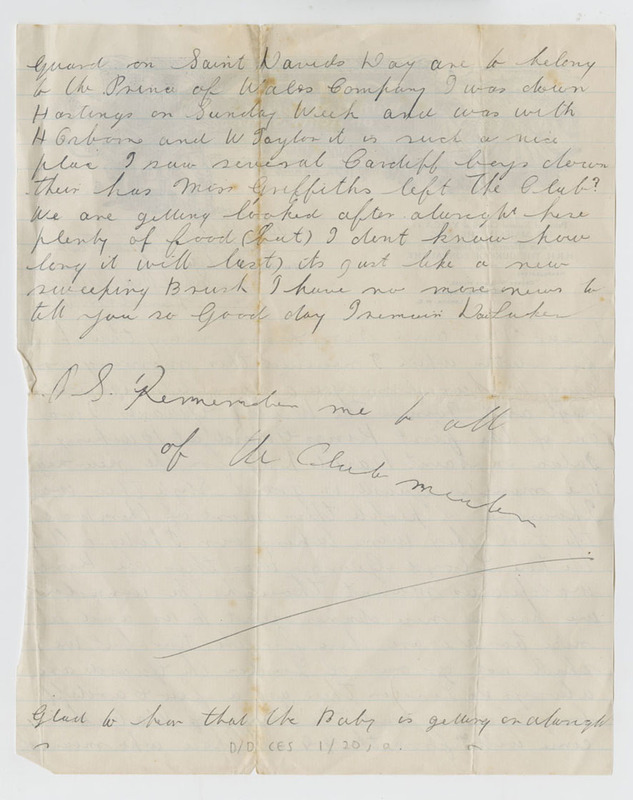 Mr and Mrs Lewis corresponded with members of the University Settlement Lads’ Club serving in the armed forces throughout the conflict, sending letters and parcels and receiving letters in return. The Lewis’ sent Christmas parcels to the boys each year, and many wrote to thank them for their generosity. John Childs writes ‘I received the parsel alright and was very please with it. I hope that all the members enjoyed their Christmas as I am please to say I enjoyed mine… Remember me to all the members wishing them a happy New Year and may the war soon be over’. 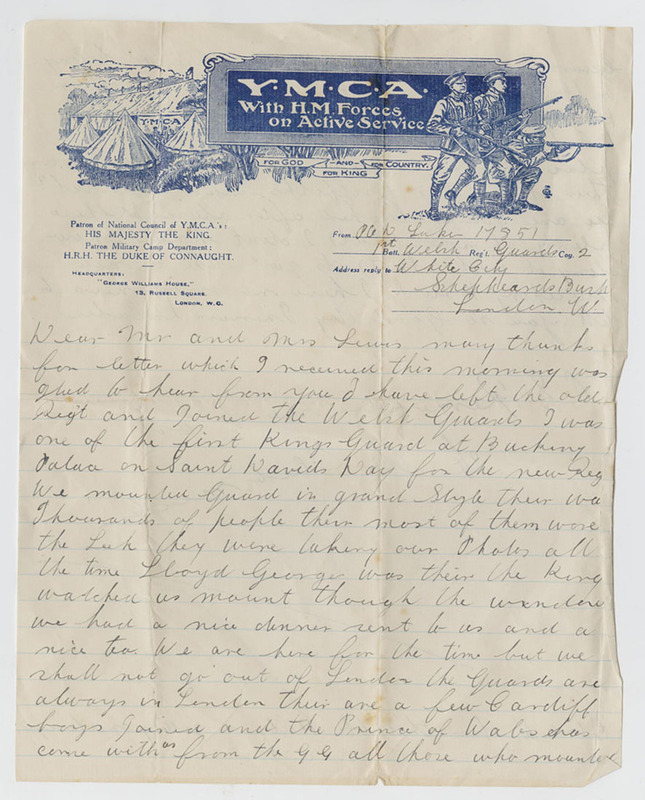 On 15th December 1915, Mr Lewis received a letter from James Hawkey, stationed at the Front. Again, he thanks them for their kindness in sending a Christmas parcel, and assures them it has arrived safely, commenting ‘…I am in the pink and quite comfortable considering the circumstances’. He wishes everyone a Merry Christmas and a Happy New Year, finishing with ‘P.S. If I get a chance I will send at least one Christmas card…’. Driver A. Morgan made the effort of writing a thank you note for his Christmas parcel on 20 January 1917, despite the fact that ‘…I cannot write a letter to save my life. It is not in my line’. James Reece also wrote to thank Mr Lewis and the members of the Club for his parcel; ‘…the contents were just what I required and please thank the members of the club on my behalf for what they have done for us chaps out here’; and Gunner C. Upcott writes, ‘I do not know how much to thank you for your kindest’. The Christmas parcels from the Settlement were obviously very much appreciated and valued by the boys, not only for their contents but for the kind thoughts and good wishes they represented. One of the Christmas communications stands out more than the others: a postcard from D. McDonald, a member of the Lads’ club who was serving in the Army during the war. 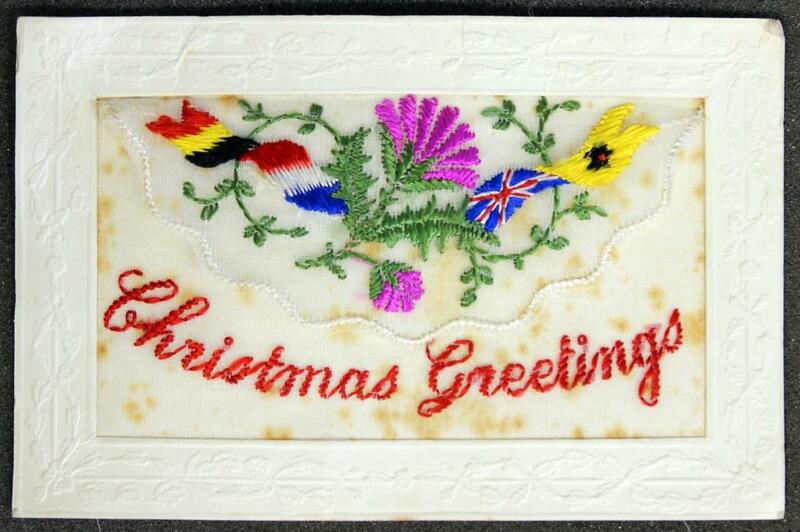 The postcard depicts the flags of the allied nations of the First World War – Belgium, France, the UK and Russia – beautifully interwoven with a thistle and the words Merry Christmas. It is hand embroidered on a piece of silk mesh. These embroidered postcards were mostly produced by French and Belgium women refugees working in refugee camps and temporary homes. The finished embroidery was sent to factories to be cut and mounted on card. 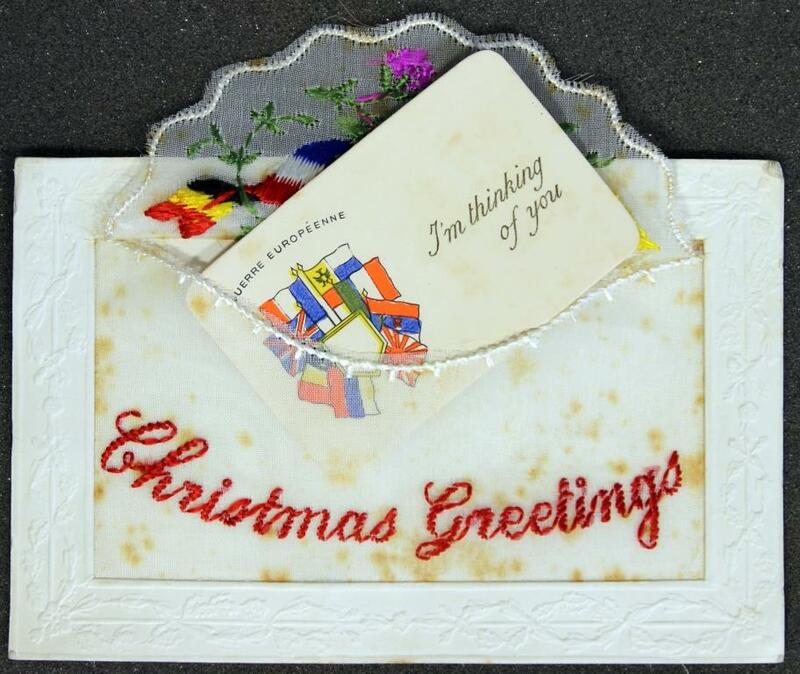 Embroidered postcards were extremely popular with British servicemen on duty on France as they made such a lovely memento for their recipient. The central portion of the embroidery is cut as a flap and contains a tiny printed greetings card with the message ‘I’m thinking of you’. The back of the postcard bears the message, ‘From D MacDonald to Mr and Mrs Lewis and wishing you a prosperous New Year’. There is no stamp on the card as it would have been sent via the military mail at no charge to the sender. At the end of the war it proved impossible to resume the University Settlement activities as so many of the members had dispersed. The University Settlement Company was formally wound up in 1924. Glamorgan Archives holds no further correspondence from the University Settlement lads after the war years. We do not know if they survived, or if they ever returned to Cardiff.